It's been rainy and cold 'round these parts lately...which is super confusing because it's the middle of May. So that means instead of spending time outside, Jillian and I were confined inside, which lasts all of 2 hours before we're both bored and annoying each other. Sooo Field trip time! I had an errand to run at Lowe's and saw that Petsmart was right next door. With all of the pets they have out on display, I figured it'd be like a mini zoo experience. And I was right! Jillian loved it and freaked out over all of the fish tanks. She even got to hold a few kittens! I think we spent a total of almost an hour just looking at all of the critters in their cages. But what fun is going to a pet store if you don't come home with a pet?! 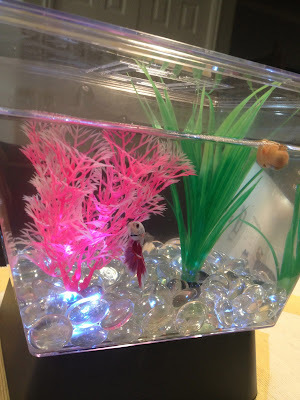 After talking to one of the employees, I realized the easiest pet to take care of would be a beta fish, so home with a beta fish (and a snail just for fun) we went. Jillian LOVES it! Unfortunately snail #1 died within about 30 minutes of being home (lame), but thanks to Petsmart 14 day guarantee we just went back and got another one! We did have a bit of a "Darla from Nemo" experience where Jillian kept wanting to bang on the tank, scoop the fish out with her fingers, dump half a bottle of food in the tank, etc. It's a work in progress.